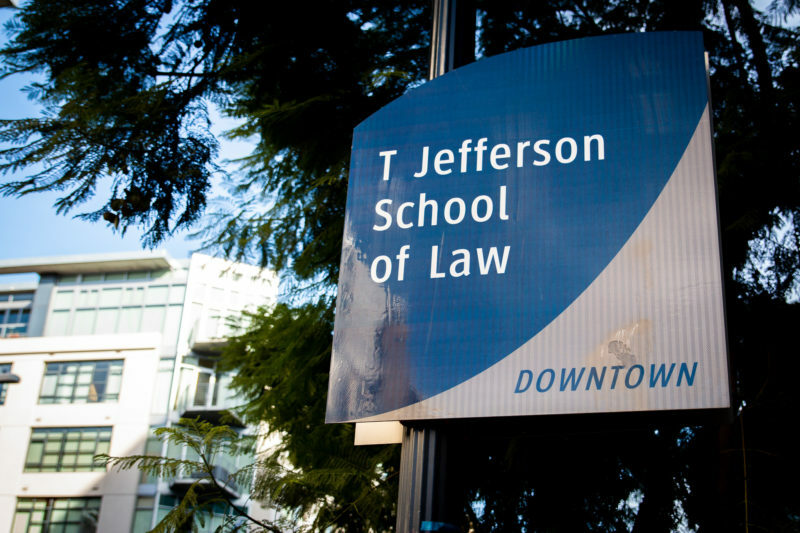 The Thomas Jefferson School of Law in downtown San Diego is in turmoil. Lyle Moran, a VOSD contributor, reports that several factors are threatening the school’s existence. For one, the school built a $90 million facility in the East Village and struggled to pay the debt amid the financial recession — at a time of declining consumer interest in the legal profession. Its students have also struggled after graduation, with considerable levels of debt, and that’s made recruitment difficult. Just 30 percent of Thomas Jefferson’s first-time takers passed the July 2017 California exam, by far the lowest percentage among the state’s 21 American Bar Association-accredited schools. The test: The ABA placed Thomas Jefferson on probation. In hopes of forestalling the loss of accreditation, the school has in recent months drastically reduced the size of its student body and physical footprint, and offered more one-on-one support. President Donald Trump threatened Monday to permanently close the border — not just a particular port of entry — drawing condemnation from local officials. The San Ysidro port of entry, one of the world’s busiest crossings, was closed for roughly five hours Sunday after U.S. Border Patrol agents fired tear gas into a group of marching migrants from Central America who are seeking asylum. More than 60 crossed the border during a confrontation and could face criminal charges related to illegal entry, the Los Angeles Times reported. As the image of a woman and children running from the tear gas caused shock and outrage, U.S. Customs and Border Protection Commissioner Kevin McAleenan praised the agents for managing “a potentially dangerous situation” with no major injuries on either side. How did we get here? Desperation is colliding with the plans of a president. In this week’s Border Report, Maya Srikrishnan and Adriana Heldiz write that the Central American migrants in this current caravan are growing desperate. 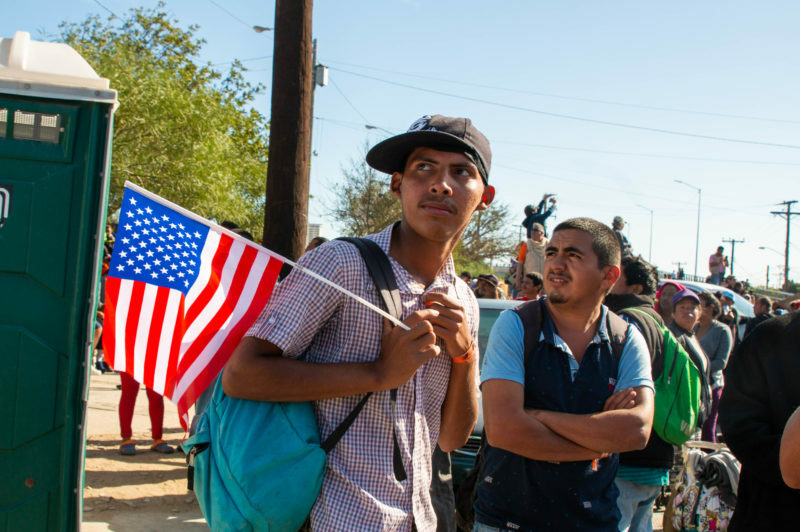 At the same time, the U.S. government has been making asylum requests more difficult. The Trump administration has long made clear that it thinks asylum is a loophole. Mexico finds itself in the middle. Here’s a short video we put together about the tense week in Tijuana that started with Mexicans protesting the migrants. The New York Times noted just how delicate the border economy is. Just a few hours of the border closure Sunday cost San Ysidro businesses $5.3 million, according to the San Ysidro Chamber of Commerce. The Union-Tribune reports that volunteer attorneys are hosting daily legal briefings with migrants to educate them on the U.S. asylum process, which can take months. One migrant told VOSD that spending months in Tijuana while he waited for his application to be processed just didn’t seem like an option. He was considering other ways to cross into the United States. To avoid a repeat of Sunday’s ugly scene, Mexican security forces have stepped up their presence at the Tijuana sports complex where thousands from the migrant caravan have been sheltered, the Associated Press reports. CBS 8 also reports that groups speaking on behalf of LGBT migrants intend to file a lawsuit in connection to a 33-year-old transgender woman and asylum-seeker from Honduras who died in immigration enforcement custody in May. An autopsy showed the cause of Roxsana Hernandez’s death was dehydration, according to the Transgender Law Center. The Democrats will enjoy majorities in the state legislature unlike anything they have seen in decades and it could get just one seat stronger for them. Assemblyman Brian Maienschein’s lead in the District 77 race has narrowed to just 864 votes after Sunday Gover gained 1,322 votes on him in the latest count. The latest update from the Registrar of Voters released Monday evening included 7,440 votes from the district, which comprises many of the city of San Diego’s northern neighborhoods, like Scripps Ranch and Carmel Valley, along with the city of Poway and Rancho Santa Fe. Gover won nearly 59 percent of that batch of newly counted votes. The registrar says another 47,000 votes remain to be counted countywide. Be patient: The next update to the vote count won’t come until Friday. From Scott Lewis: In the early years of Voice of San Diego, few people spent more time on the phone with us than Mel Shapiro. He wasn’t always happy — in fact, I’m not sure I remember him smiling. But he was a relentless and fierce advocate for open records and meetings. His name is part of precedent-setting lawsuits that forced the city to be more clear about what it was planning to do in closed sessions. He was a relentless thorn in the side of city government. He sometimes ventured into outright politicking — like when he put his own money in the campaign against the strong-mayor form of government. And he had a distinct point of view, namely that downtown’s power brokers could not be trusted. In 2012, the local chapter of the Society of Professional Journalists gave him the Sunshine Award and he chose to accept it in the City Clerk’s office, where he was a familiar face. Democracies are a delicate balance between intensely competitive interests. We cannot have progress unless they make deals. But we cannot avoid corruption without transparency. For decades, San Diego had one reliable warrior for transparency and now, at 90, he has passed. RIP, Mel. The Morning Report was written by Jesse Marx and Lisa Halverstadt, and edited by Scott Lewis.